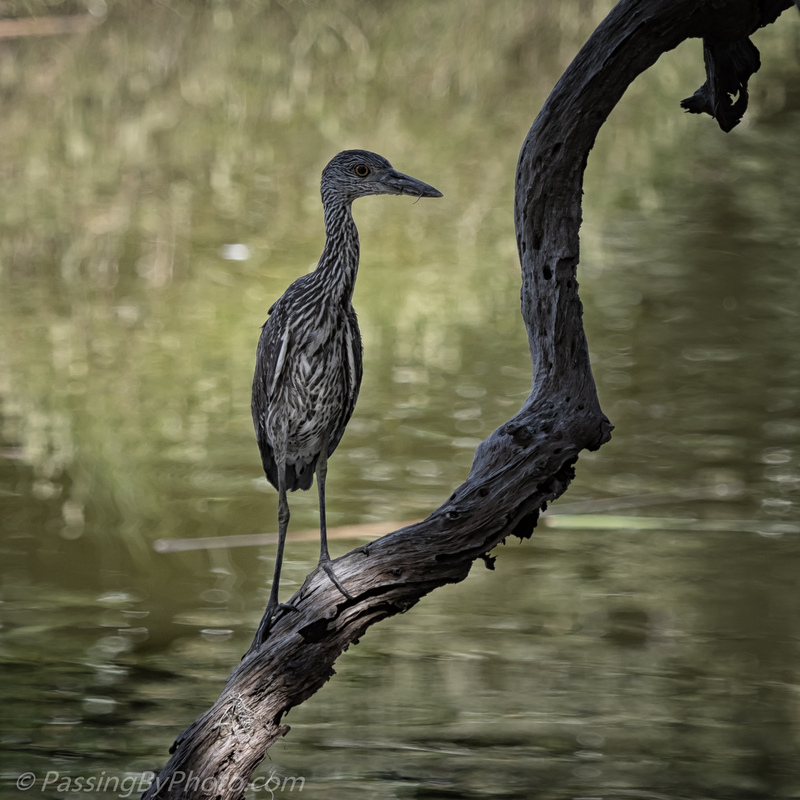 This young Yellow-crowned Night Heron was concentrating, although it was hard to say on what. 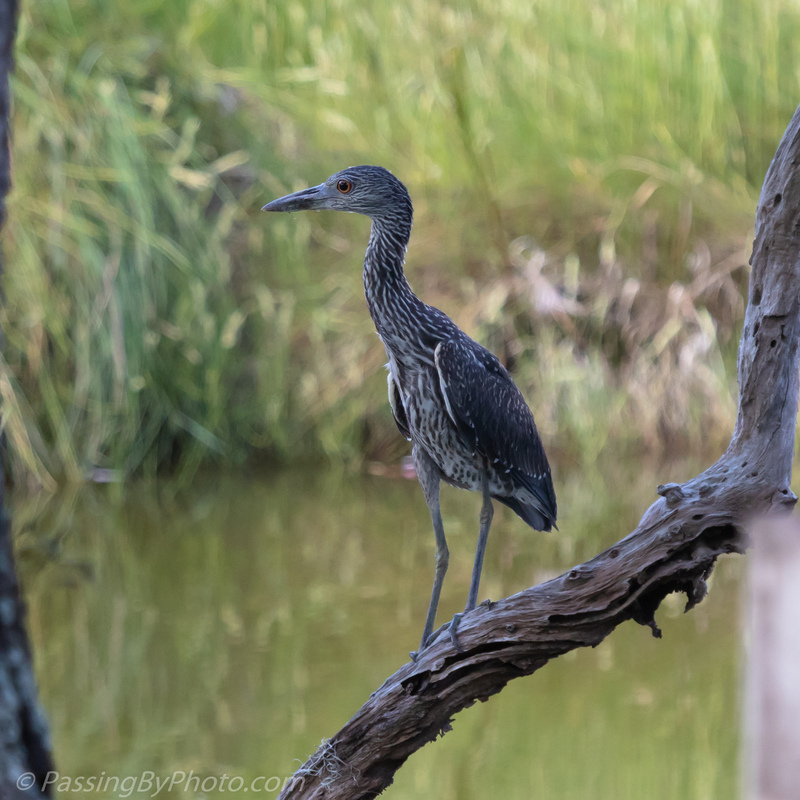 His perch of a dead limb was hanging over a pond where he could go fishing, but he didn’t seem to be watching the water. I watched awhile to see if he would come out into the brighter light. 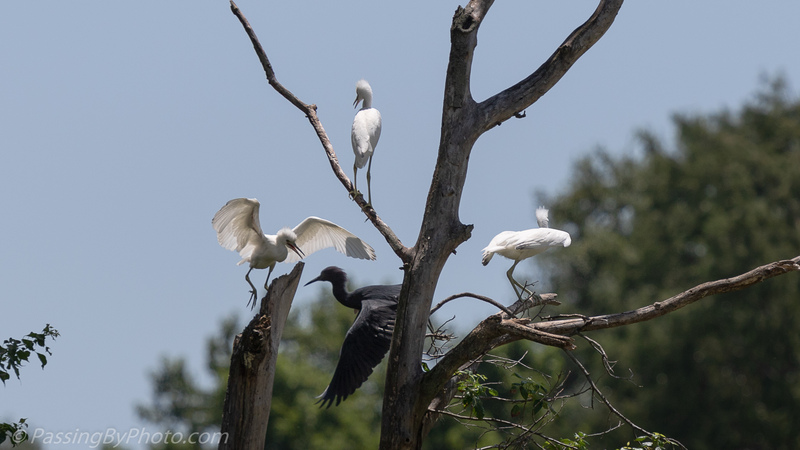 He was content to stay where the overhang of a larger tree provided some shade, occasionally changing direction and practicing the heron “standing still” skill. 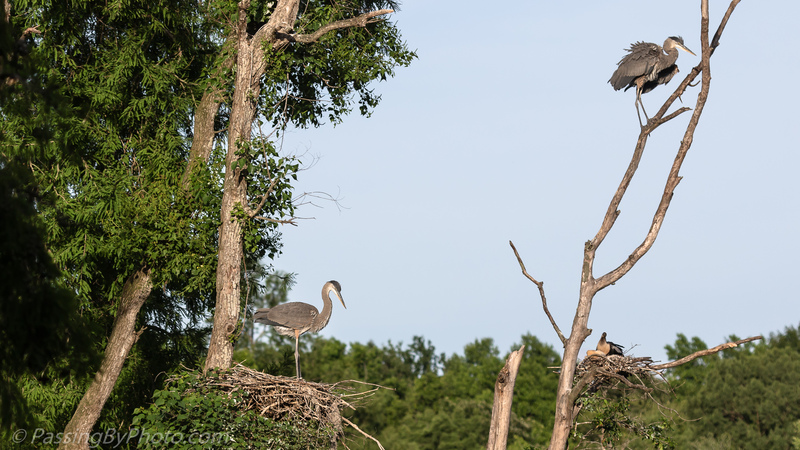 Adult Little Blue Herons actively teach their young how to fly, encouraging them to take off by demonstrating and often tempting them to the end of branches with food. 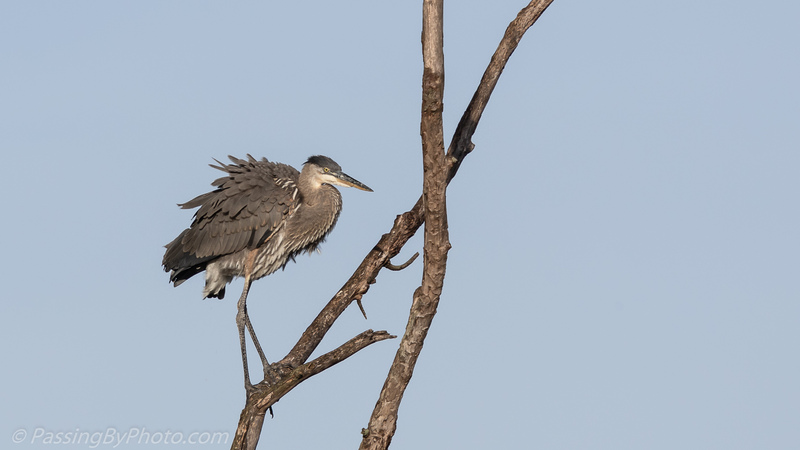 This adult and the juvenile on the right had their legs intertwined so I thought for sure the juvenile would launch. 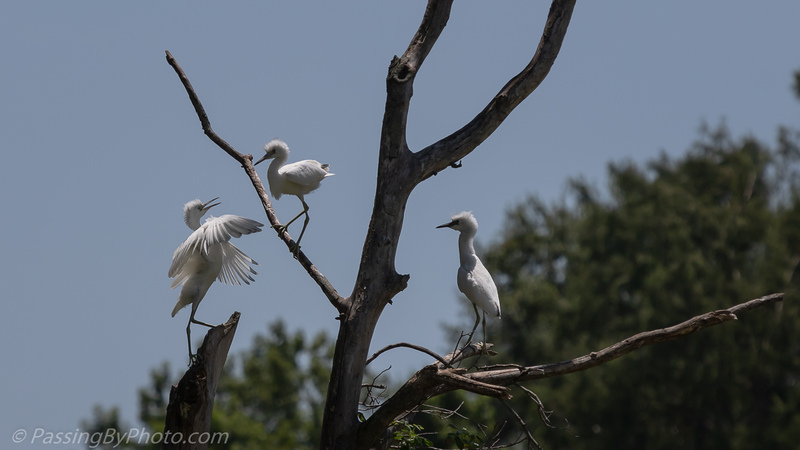 The juvenile of this trio on the left had at least a short hop down as he arrived from a nearby tree after I started taking these images. The adult took off. 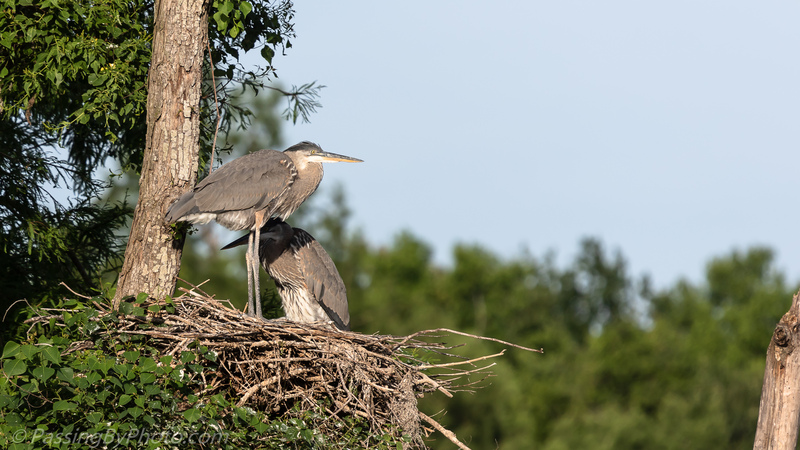 None of the three juveniles followed the parent. 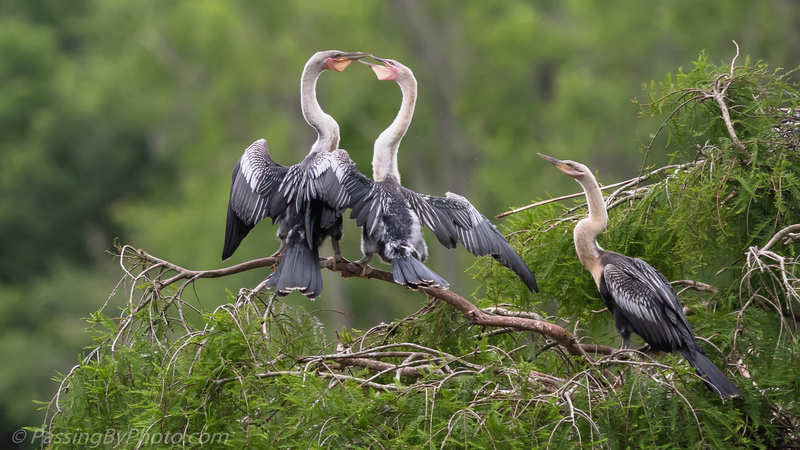 After a little squabble the three settled down to wait for the adult to return for another try. 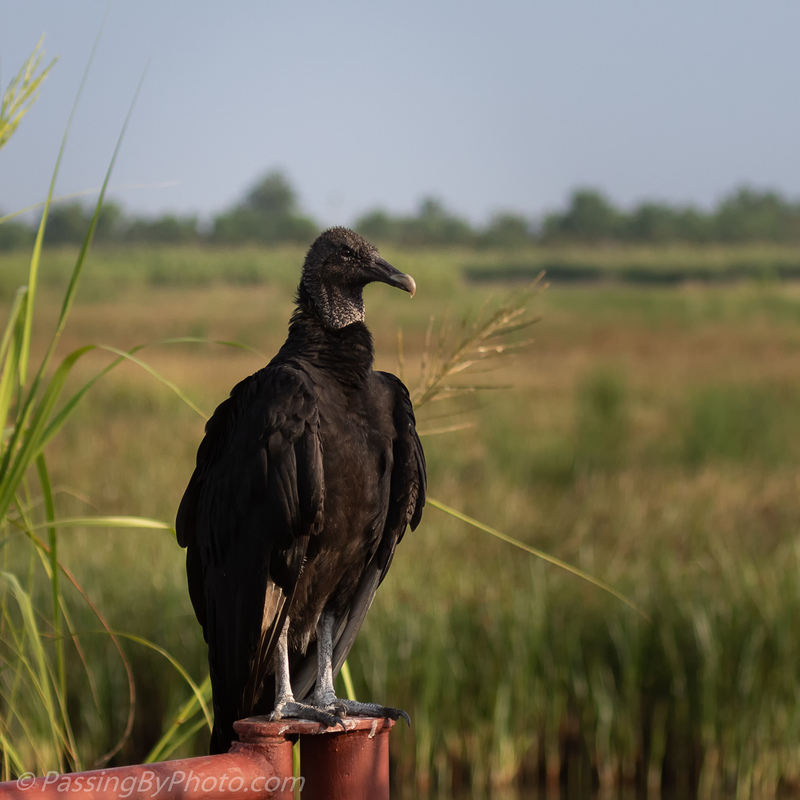 As we approached the turnaround on one of the dikes in the wildlife management area we were visiting a juvenile Black Vulture stood in the middle of the road. Unfortunately he showed no fear of our car or us and only hopped along a few feet. Ted finally got out of the car to gently urge him out of the driveway and he flapped/hopped up onto the gate, allowing me to turn the car without worrying about hitting him. His still fuzzy head and hopping rather than flying identifies him as a juvenile. We walked around the opposite end of the gate and went on our way. When we returned twenty minutes later he had relocated to the other end of the gate. 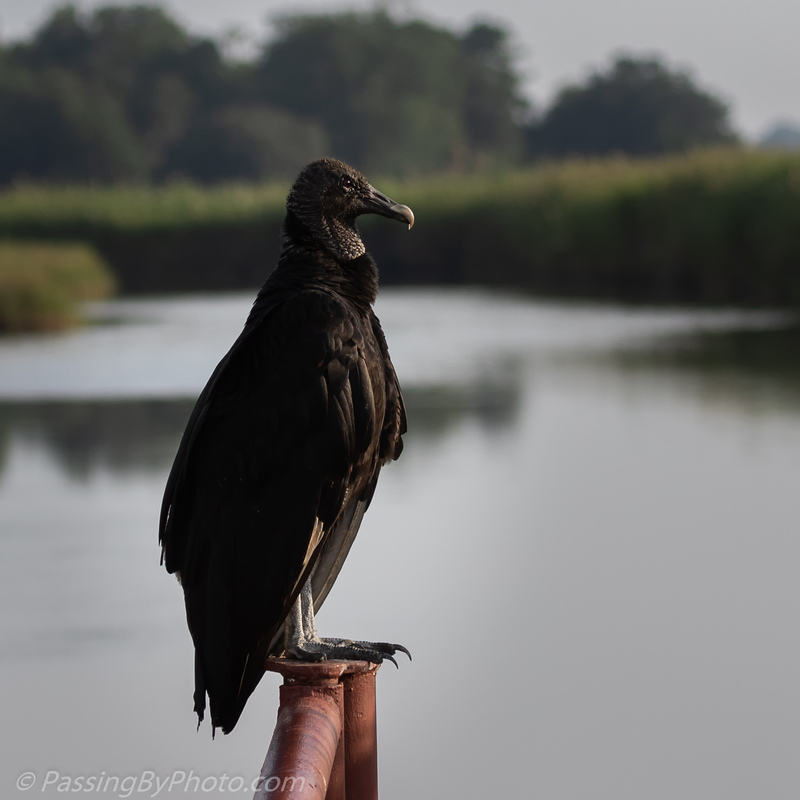 Quite regal looking, he ignored us as we passed back by and I saw him still there in the rear-view mirror as we drove away. 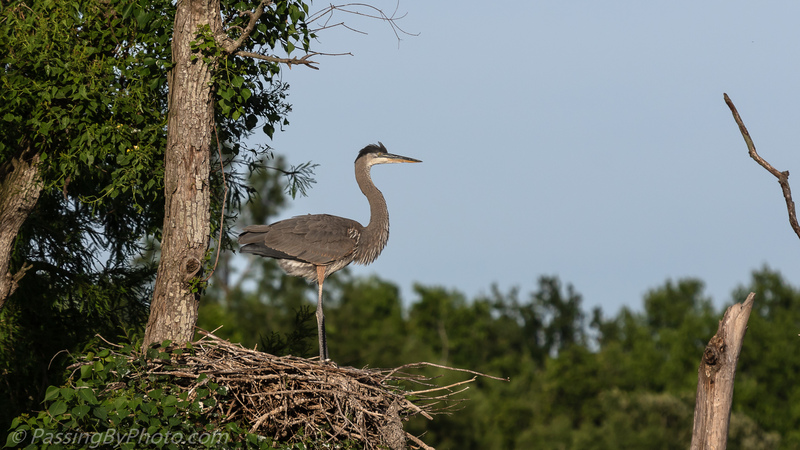 The Great Blue Herons have all fledged and have mostly left the rookery area. 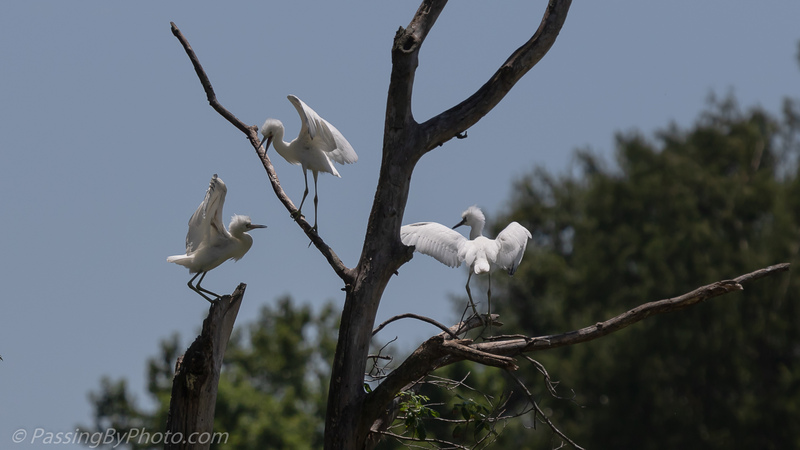 A few later starting Great Egrets chicks are still around, but they have grown to almost adult size and won’t be around much longer. 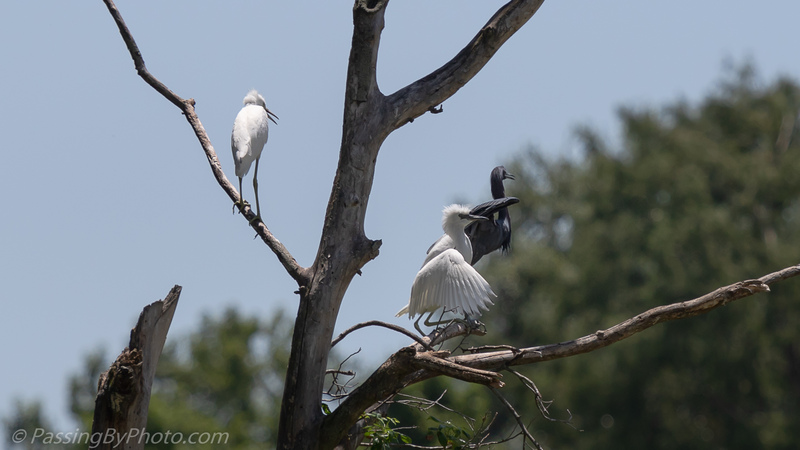 This pair looks a little goofy as they look around on a hot day. 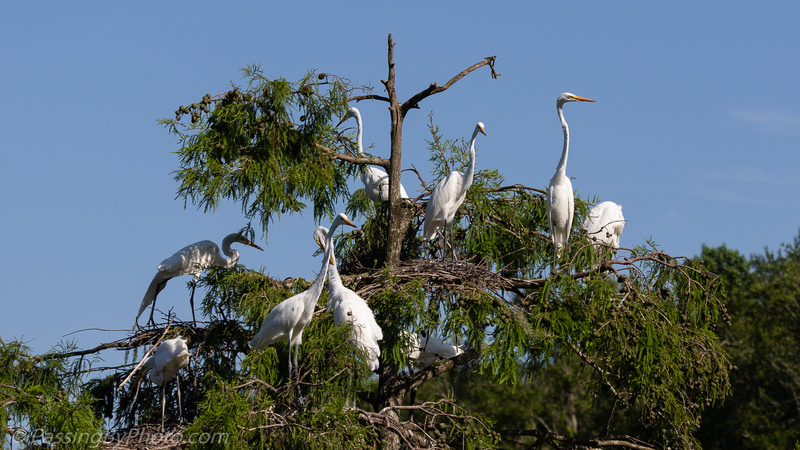 Some of the Great Egret chicks are showing a lot of interest in the world beyond their nest and they have spread out into the space vacated by the Great Blue Heron chick. I’m not sure which one of this pair actually took the flight; it was about five minutes after this first image that I noticed that one of them was gone. Not far as it turns out, on that first hop. 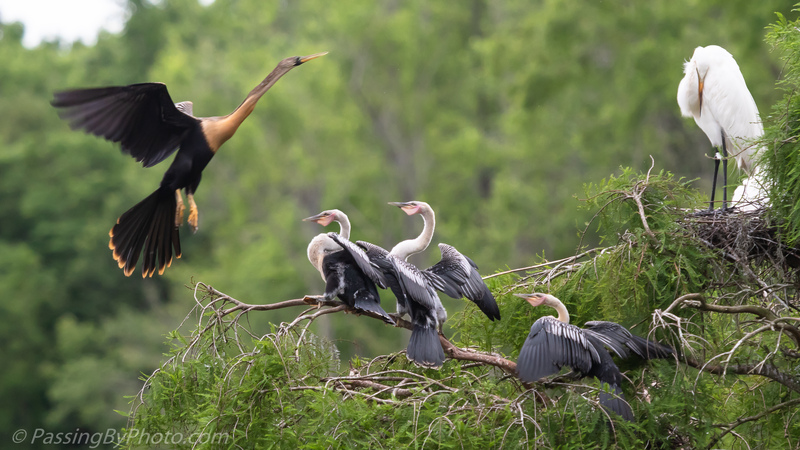 He eventually made his way to the top of this branch and took off, After circling around the back side of the island he returned to the nest, a real flight! 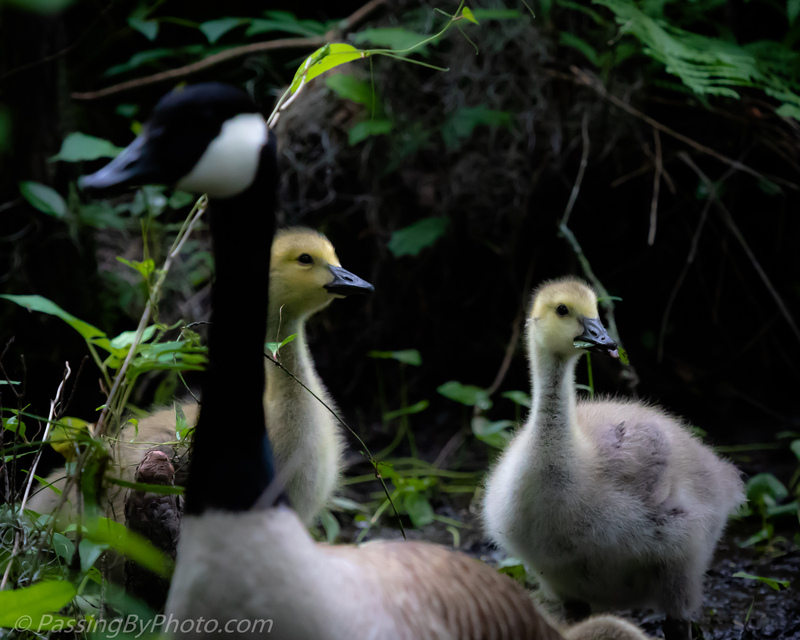 A Canada Goose family was wandering through the edge of the cypress swamp, with the goslings foraging for food under the watchful eyes of their parents. 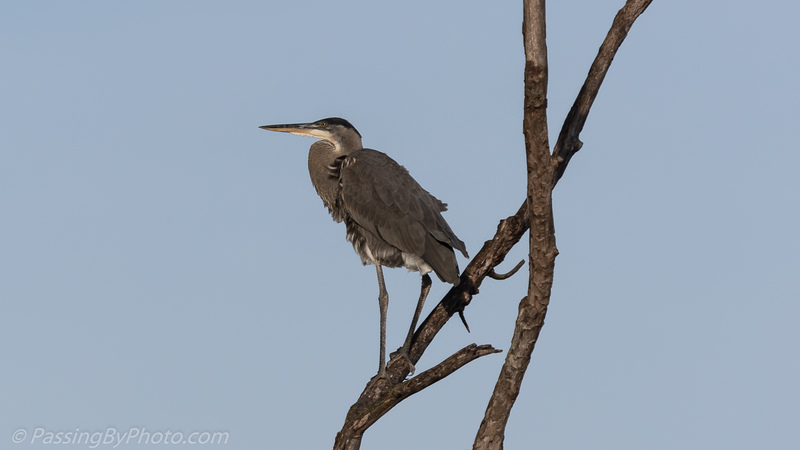 It was a cloudy morning and there was a full canopy above us so the images had a very high ISO. 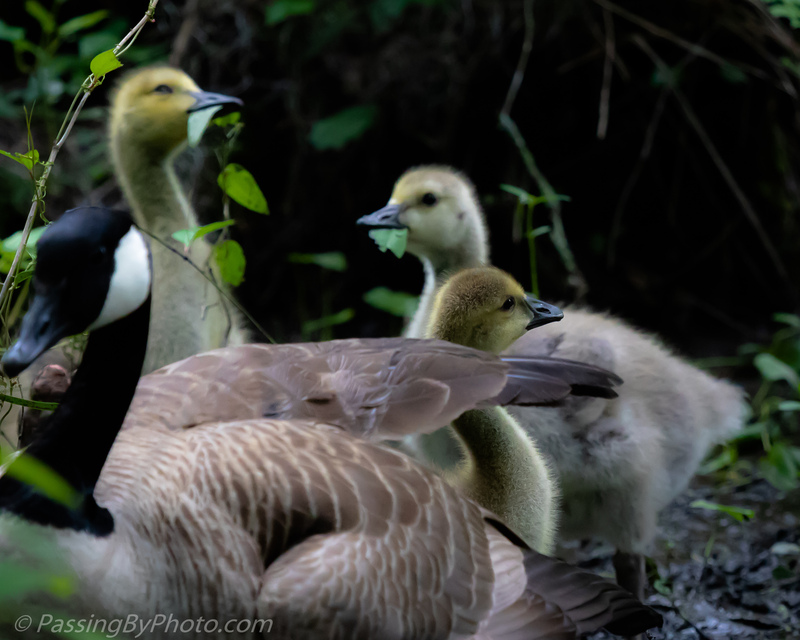 I reduced the noise and clarity which gave the youngsters a soft look that I found appealing. 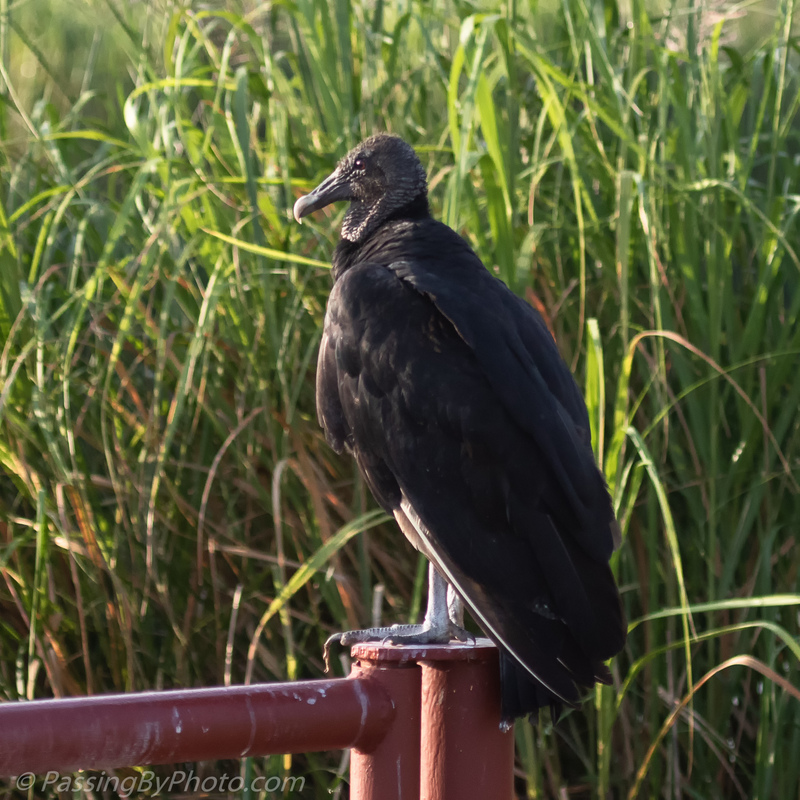 They stayed surprisingly close to the boardwalk even as we approached, but before long the adults steered their charges back into the water. 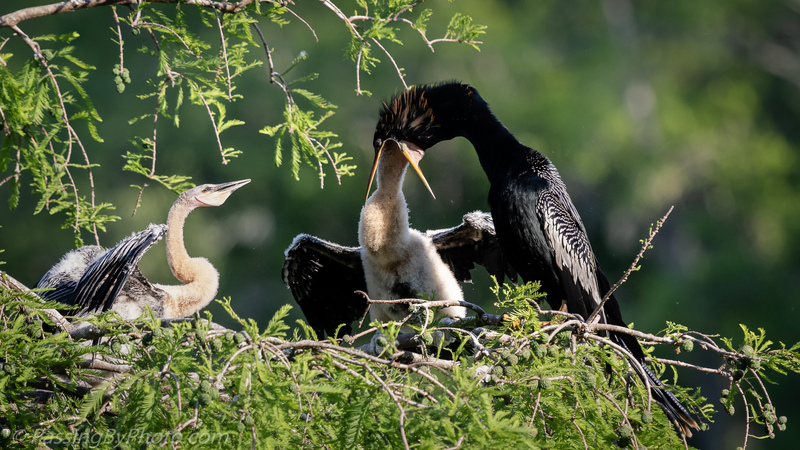 These three chicks really look like Anhingas now, with the classic black and white “piano key” feathers on their wings. 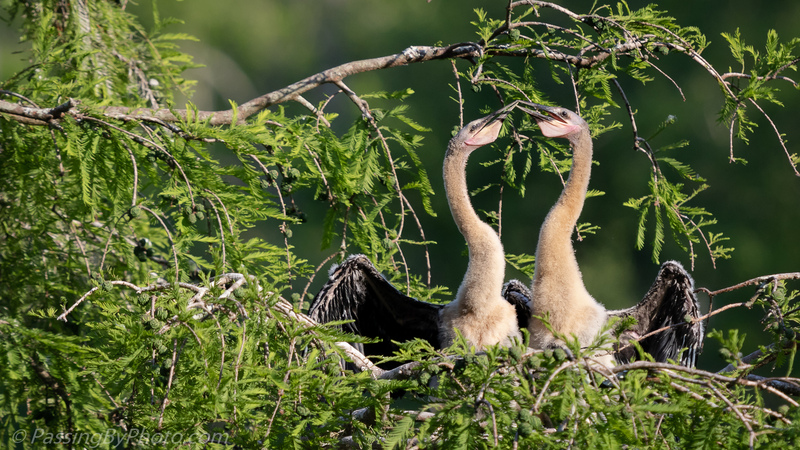 Like the wading bird chicks in nearby nests these older chicks are spending more time interacting with each other as they wait for the parents to bring food. 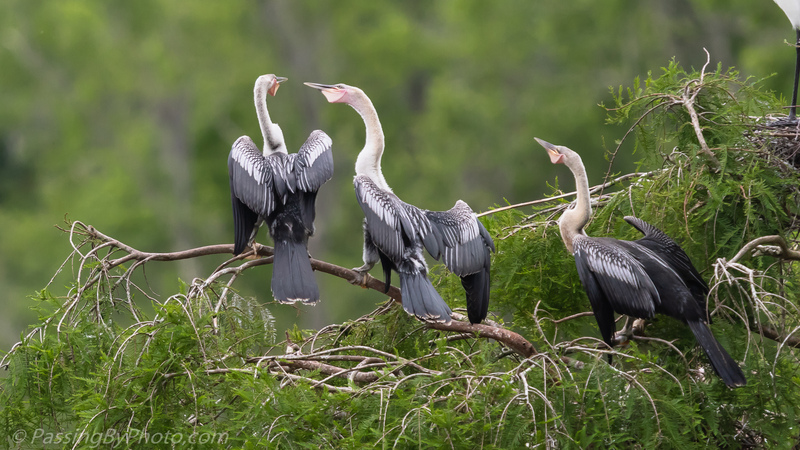 These three were so busy they didn’t even notice when one of the parents was on its approach. Just as well, because she kept right on going. I don’t know what made her abort her landing, but she circled around the tree for a second try and successful touch down. 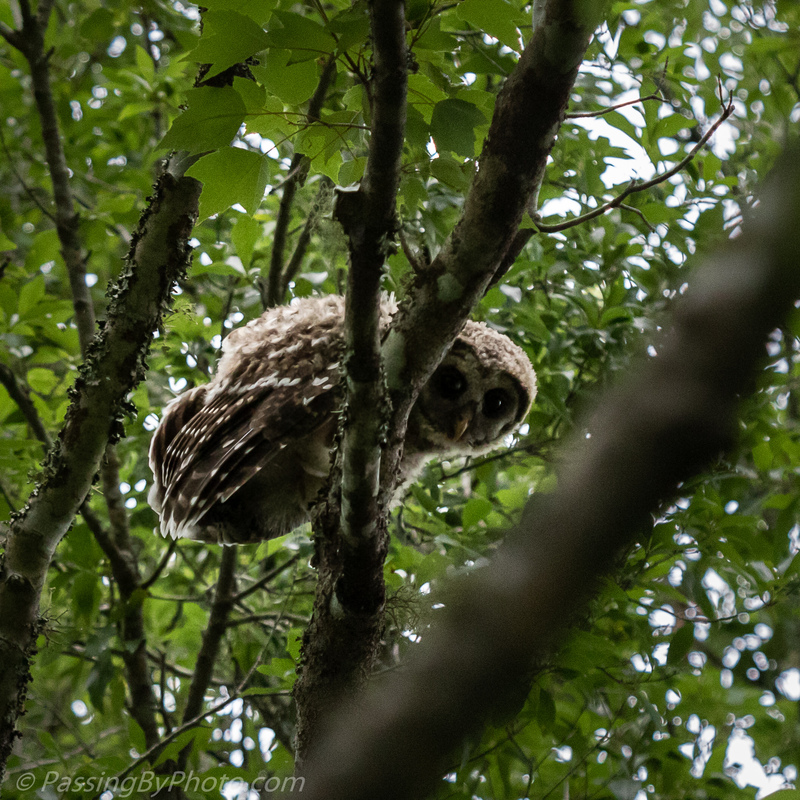 A Barred Owl pair with two fledged owlets has been seen regularly from the boardwalk at Beidler Forest. 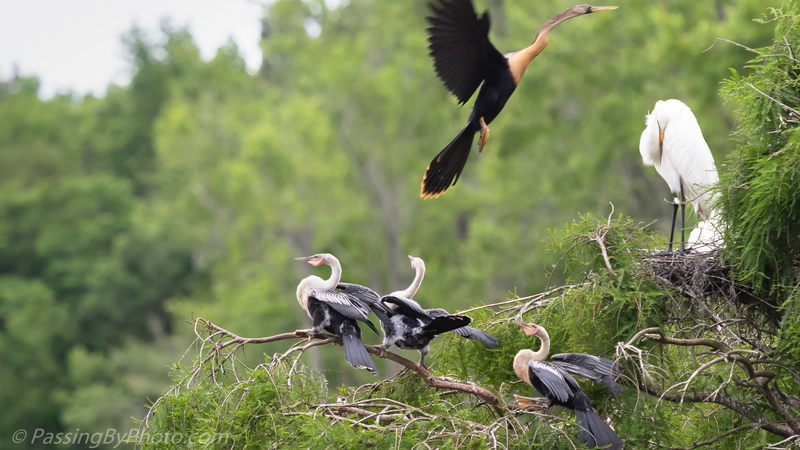 We spotted just this one youngster taking short flights in the limbs above us. 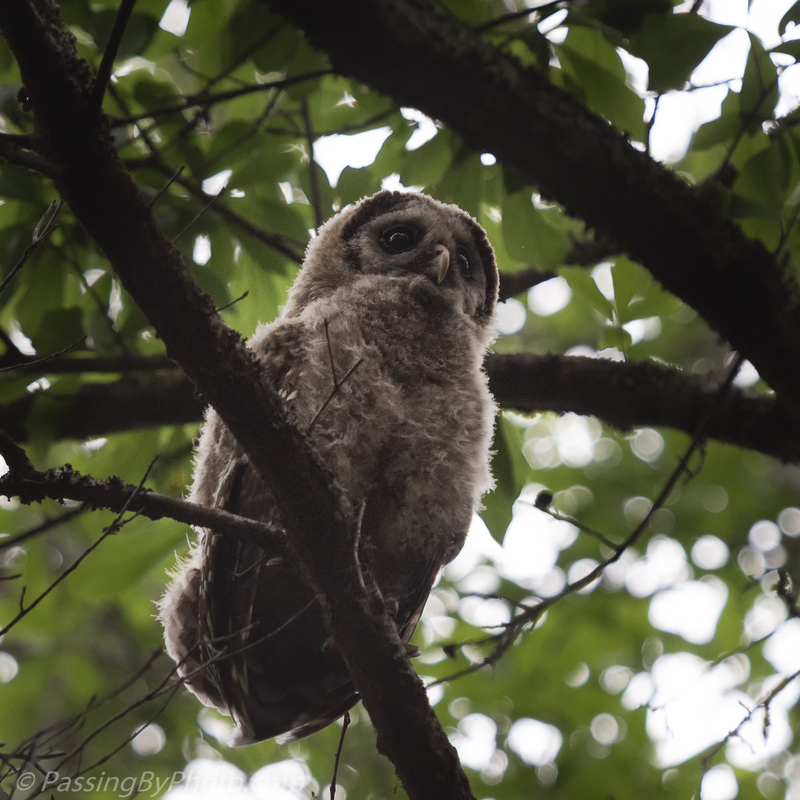 The owlet was curious about the humans passing on the boardwalk below him, not bothered by our presence. 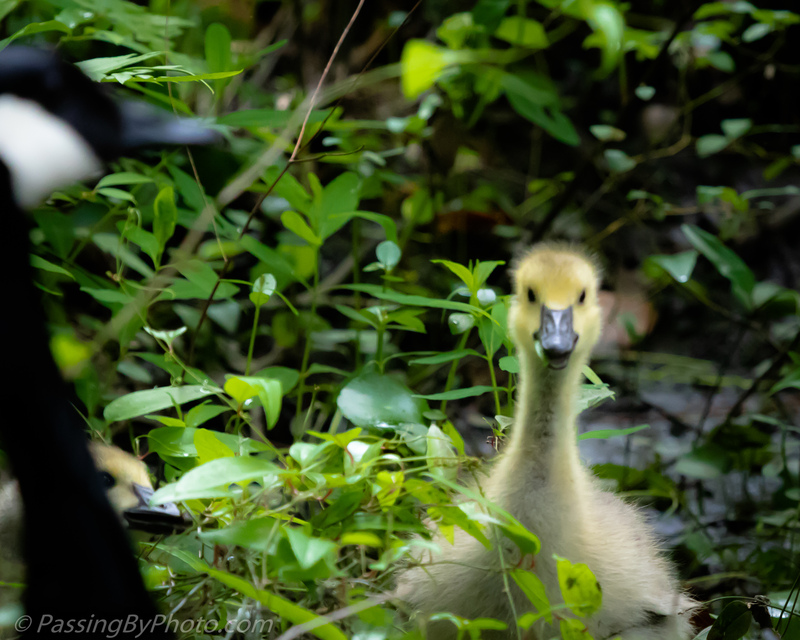 A school group of about twenty-five kids and chaperones had just passed and a few of their stragglers stopped with us to watch the chick. 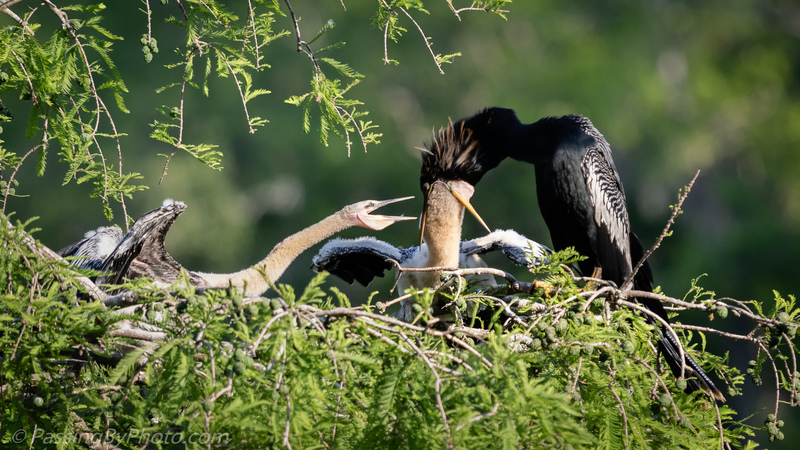 After the adult Anhinga finished feeding the one chick, the unfed chick started to pester his sibling. 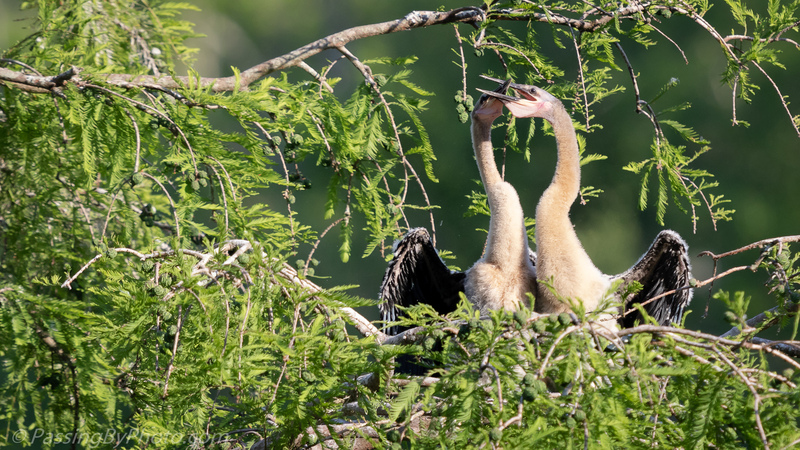 He used the same chewing on the beak method all the young use on the parent when they return to the nest. I couldn’t tell if the second chick got any food from the first one or if this was all show. The adult didn’t stick around to find out. 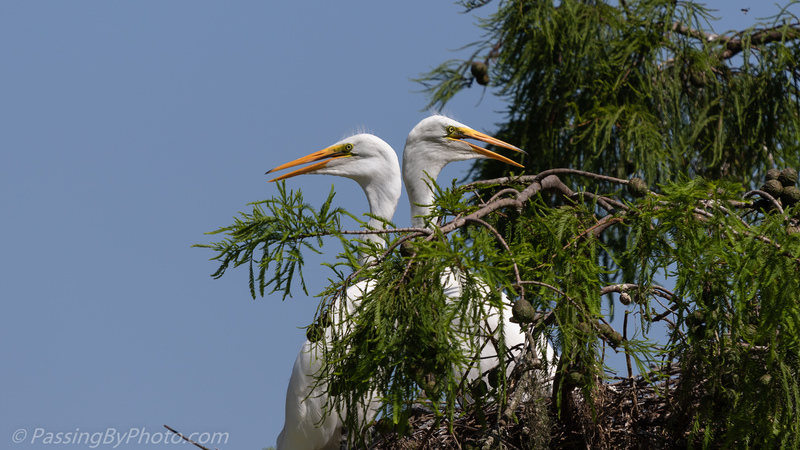 These two chicks are older than the four from last night’s post, where I described how the adult regurgitates the food. It’s a little weird the second time you see it, too. 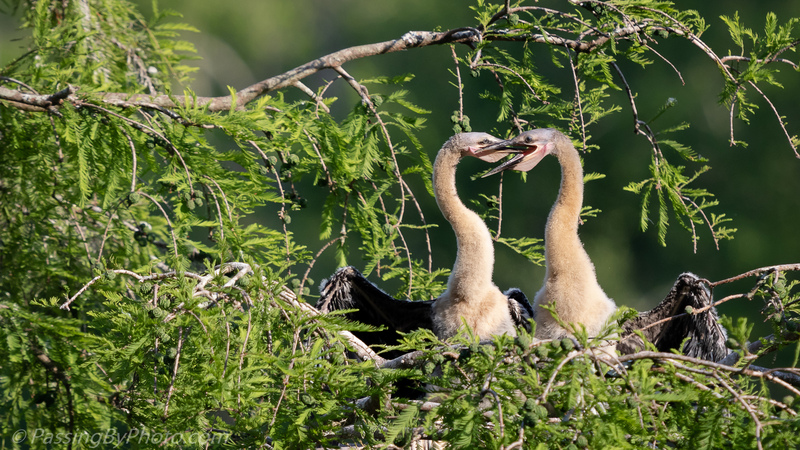 These chicks were a bigger target for me and I had a much better vantage point to see the feeding action. 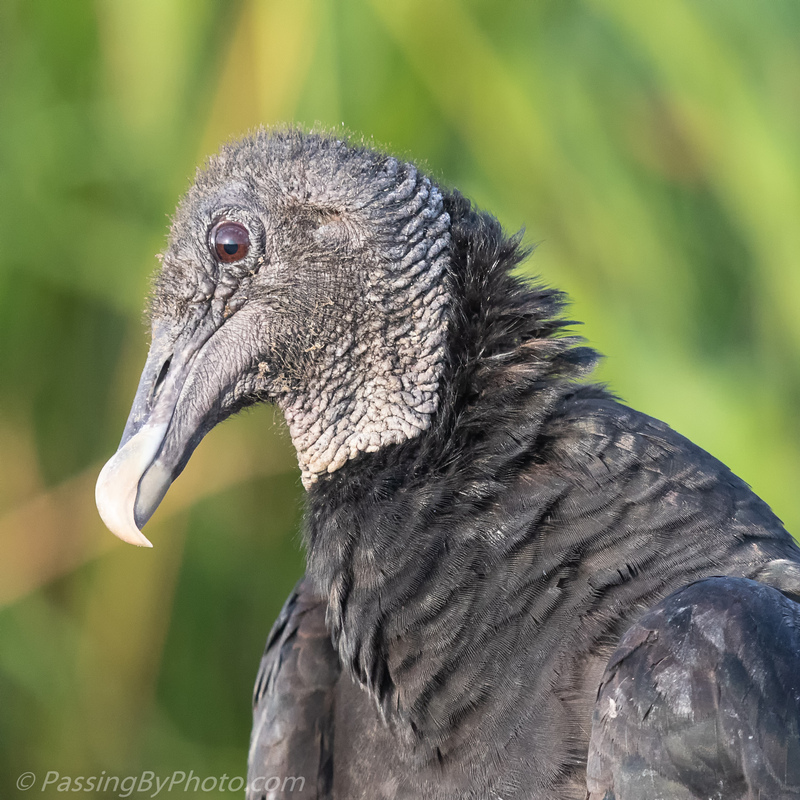 Some feathers are starting to grow on the chicks’ necks, making them look more appealing and bird-like. 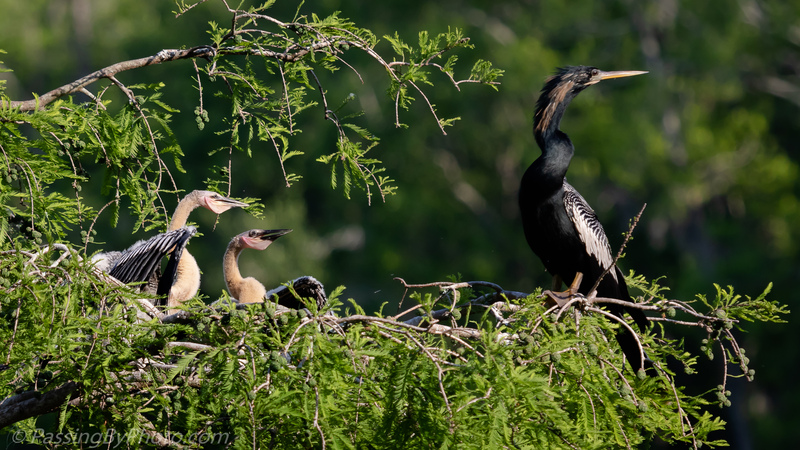 Anhinga can swallow very large fish, much bigger than their heads. You can see here the flexibility of their jaw. 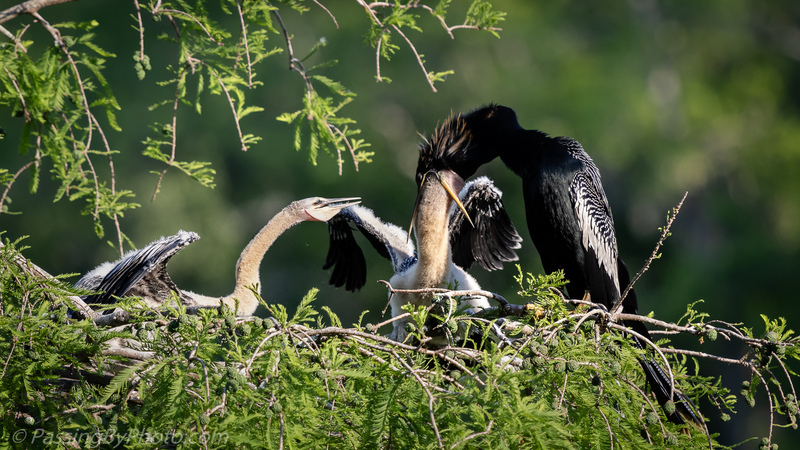 The adult only fed the one chick then moved out of their reach.